Drivers turning onto Sam Jones Expressway from High School Road immediately enter a diamond interchange with Interstates 74-465. A right-turn awaits those bound for the Beltway south to Interstate 70 west and Beech Grove. Traffic to Interstate 70 east should remain along the expressway to its direct interchange with the freeway into downtown. Photo taken 02/25/12. Passing over the Beltway, motorists bound for Interstates 74-465 north to Garden City and Speedway depart next. Photo taken 02/25/12. Accelerate465 replaced a loop ramp onto the Beltway north with two left turn lanes at a traffic light. Photo taken 02/25/12. The sign bridge pictured here was removed during Accelerate465 reconfiguration of the Sam Jones Expressway. Photo taken 11/05/09. Sam Jones Expressway lowers from the beltway to meet Executive Drive at a pair of loop ramps. Executive Drive stems northeast from Fortune Circle through a sprawling business park, to Minnesota Street. This sign bridge replaced a similar one in the same location, albeit with a different font. Photo taken 02/25/12. A jersey barrier median lines Sam Jones Expressway from the Beltway east to Interstate 70. Traffic to Executive Drive must use the Lynhurst Drive parclo interchange for return access to the expressway. Photo taken 11/05/09. Lynhurst Drive ties into Sam Jones Expressway immediately to the east of Executive Drive. The north-south road travels between Mars Hill residential areas south Kentucky Avenue (former Indiana 67) and West 25th Street in Speedway. Photo taken 11/05/09. A folded-cloverleaf interchange provides connections between eastbound Sam Jones Expressway and Interstate 70 east to downtown Indianapolis. Photo taken 11/05/09. Interstate 70 eastbound arcs into West Indianapolis on the four-mile trip into downtown. Beyond the freeway junction, Sam Jones Expressway transitions into a surface route at Stout Field West Drive. Photo taken 11/05/09. Sam Jones Expressway enters the Park Fletcher section of Indianapolis west from Interstate 70. A parclo interchange with Lynhurst Drive follows. Junction Interstates 74-465 is just 3/4 of a mile away. Photo taken 11/04/11. Lynhurst Drive comprises a four-lane arterial serving nearby office parks. The north south road connects the Drexel Gardens community with Kentucky Avenue (former SR 67) leading out from Sam Jones Expressway. Photo taken 11/04/11. Executive Drive angles southwest from Minnesota Street to Fortune Circle to provide the gateway route into a large business park residing between the Indianapolis Beltway and Lynhurst Drive. Loop ramps provide access to the north-south road from Sam Jones Expressway. Return access requires a drive east on Bradbury Street to the Lynhurst on-ramps. Photo taken 11/04/11. Accelerate465 construction reconfigured the former directional cloverleaf interchange between Sam Jones Expressway and the Beltway into a standard diamond interchange. With the terminal of Indianapolis International Airport (IND) shifting to a new site off Col. Weir Cook Memorial Drive, the importance of Sam Jones (then Airport) Expressway diminished, so a downgrade in the interchange was undertaken rather to save on costs vs. upgrading the junction. Photo taken 11/05/09. Second photo taken 02/25/12. Signalized intersections now handle the movements between ramps of Interstates 74 & 465 and Sam Jones Expressway. A loop ramp was replaced with a left turn for motorists bound for the Beltway southeast. Photo taken 02/25/12. Second photo taken 11/05/09. 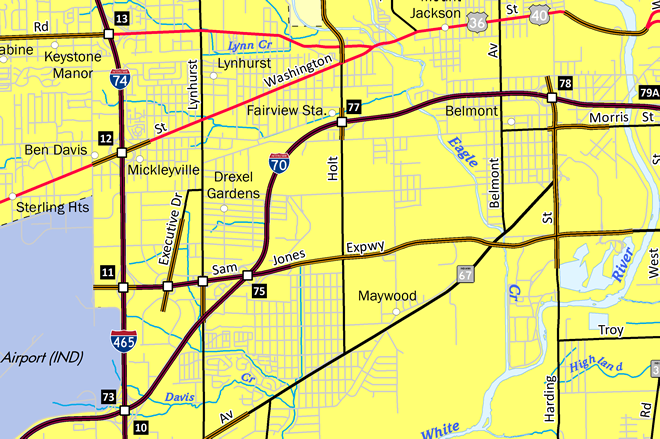 Interstates 74 & 465 combine from Speedway south and east to Five Points through southwest Indianapolis. The tandem next meet Interstate 70 south from Sam Jones Expressway. Photo taken 11/04/11. Approaching the end of Sam Jones Expressway at the signalized intersection with High School Road. A portion of High School Road was a part of the original Indiana 100 beltway for Indianapolis. Photo taken 02/25/12. An older button copy sign, removed by February 2012, was retained to direct drivers south on High School Road to Perimeter Road for the Air Cargo facilities of Indianapolis International Airport. Parking garages rise in the background as part of the original airport terminal. Photo taken 11/04/11. Interstates 70 and 465 trailblazers posted at the High School Road northward turn at Cargo Drive. Sam Jones Expressway is the next intersection along the road. Photo taken 11/04/11. A two-lane turn lane carried traffic onto the eastbound beginning of the Sam Jones Expressway. The original ramp configuration saw a loop ramp drop from the eastbound freeway onto Interstates 74-465 north to Speedway. Accelerate465 construction combined two ramps for northbound into one. Photo taken 02/25/12. Mast-arm signals govern the movements between High School Road and the west end of Sam Jones Expressway. A state-named shield for Interstate 465 directs drivers into the adjacent diamond interchange. Photo taken 11/04/11. High School Road connected the west end of Sam Jones Expressway with the passenger terminal of Indianapolis International Airport (IND) before a new facility was built midfield in 2008. A rusty sign bridge remained along northbound at the now-closed on-ramp to the terminal in this scene. Photo taken 11/04/11. A number of parking lots sit idle with the relocation of the terminal away from High School Road and Sam Jones Expressway. A set of mast-arm supported signals were set to flash mode on High School Road northbound at West Raymond Street. Photo taken 11/04/11. An overhead directed drivers from facilities along Raymond Street onto High School Road southbound for the Sam Jones Expressway interchange with Interstates 74-465. Photo taken 11/04/11. Southbound High School Road at the closed on-ramp to the former passenger terminal at Indianapolis International Airport. A new sign was installed to direct motorists onto Interstates 465 south and 70 west to reach the 2008-opened midfield terminal. Photo taken 11/04/11. Sam Jones Expressway stems east from High School Road directly to Interstates 74-465 nearby and Interstate 70 east in 1.5 miles. Note the state-named shields used on the overhead panel. Photos taken 11/04/11. High School Road turns east a short distance south of Sam Jones Expressway at Cargo Drive. The road becomes South Perimeter Road encircling the airport. Photo taken 11/04/11. Executive Drive passes over Sam Jones Expressway and approaches Bradbury Street. Trailblazers for Interstates 70 and 465 direct motorists east for the adjacent interchange and on-ramps to the expressway. Photo taken 11/04/11. Heading south along Executive Drive, a set of state-named trailblazers point to Bradbury Street east for the adjacent westbound on-ramp to Sam Jones Expressway leading to Interstates 74-465. Eastbound traffic must use the Lynhurst Drive on-ramp to continue along the Sam Jones to Interstate 70 east and downtown. Photo taken 11/04/11. Bradbury Street connects the westbound side of Sam Jones Expressway between intersections with Executive Drive and Lynhurst Drive. An Interstate 465 trailblazer lies ahead of the on-ramp. Photo taken 11/04/11. Signs for the Sam Jones Expressway at Lynhurst Drive include trailblazers for the respective Interstate connections. Bradbury Street meets Lynhurst north of the ramps along the eastbound side of the expressway. Photo taken 11/04/11. A left turn brings motorists from Lynhurst Drive onto Sam Jones Expressway westbound ahead of both the beltway and High School Road. Photo taken 11/04/11. Approaching the eastbound on-ramp to Sam Jones Expressway on Lynhurst Drive. A city-installed sign retains the state-name for the Interstate 70 shield representing the nearby connection with the eastbound freeway into downtown. Photo taken 11/05/09. State-named trailblazers direct motorists onto Sam Jones Expressway east for Interstate 70 and forthcoming Bradbury Street west to the on-ramp leading to Interstate 465. Photo taken 11/05/09. Bradbury Street parallels the north side of Sam Jones Expressway between Lynhurst and Executive Drives, with the on-ramp to Interstates 74-465 in between. Photo taken 11/04/11. Lynhurst Drive leaves the Drexel Gardens area and meets Sam Jones Expressway at a parclo interchange. Ramps to westbound connect with Bradbury Street. Photo taken 11/05/11. Passing under Sam Jones Expressway ahead of the eastbound on-ramp to Interstate 70, West Indianapolis and Maywood. Photo taken 11/05/11. State-named shield attached to the traffic light span wire at the eastbound on-ramp. Sam Jones Expressway sees a folded-cloverleaf interchange with Interstate 70 nearby. There is no access to westbound Interstate 70. Photo taken 11/04/11.